In a battle of breakfast foods, there is no clear winner between yogurt and oatmeal. Each provides important nutrients, and both are low in calories and fat, depending on the variety you consume. For a well-rounded breakfast, include both yogurt and oatmeal for the energy you need to get through the day. Eating a healthy breakfast aids metabolism and can help with weight loss. A staggering array of brands and varieties of yogurt is available in most grocery store dairy aisles, but read the labels closely, as many are high in sugar. Choose plain, fat-free or low-fat yogurt and add your own toppings, such as fresh fruit, for maximum health benefits. Like most dairy products, yogurt is a good source of calcium, and even people who are lactose intolerant often find they can eat it without gastric discomfort. 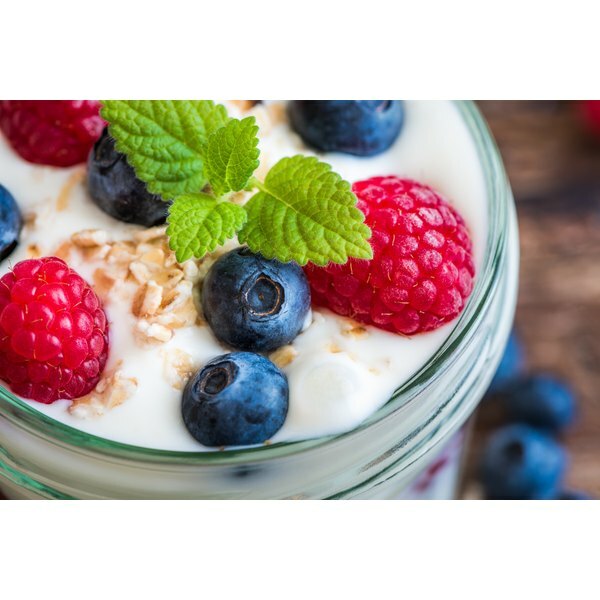 The probiotics found in some varieties, such as bifidus and L. acidophilus, aid in intestinal health and may lower your risk of infections, notes Pat Kendall, Ph.D., of Colorado State University Cooperative Extension. Oatmeal is a good source of fiber. The American Heart Association states that adequate amounts of fiber in a diet, coupled with a diet low in saturated fats, has been linked to a lower risk of developing heart disease. A 1/2-cup serving of uncooked oats provides 4 grams of fiber, 2 of which are soluble fiber. Soluble fiber can help reduce levels of LDL, or bad, cholesterol. Packets of instant oatmeal are often high in sugar; a better choice is plain rolled oats or steel-cut oats. Eating breakfast is a good start to losing weight. Katherine Zeratsky, a dietitian with the Mayo Clinic, points out that missing breakfast can trigger a response in the body to store fat, leading to weight gain. Fat-free yogurt and low-fat oatmeal are good choices for breakfast when you want to lose weight. The fiber in oatmeal can help you feel full, as can the protein in yogurt. Greek yogurt is especially effective because it has a higher protein content than other types. The calcium in yogurt is essential to healthy teeth and strong bones. Yogurt also contains potassium, which is important for heart health. Other vitamins and minerals found in yogurt include vitamin B-12, riboflavin and phosphorous. A serving of plain oats provides 10 percent of your recommended daily intake of iron, which is vital for the delivery of oxygen to cells. Iron deficiency lowers your immunity to infection and can make you feel fatigued. Oatmeal is also a good source of B vitamins. MayoClinic.com: Why Does Eating a Healthy Breakfast Help Control Weight? UW Health: The Yogurt Craze: Is It Really Healthy? Can I Eat Yogurt During Chemotherapy?